Monoclonal antibodies (MAbs) to liver cell processes are useful in the identification of hepatic carcinomas and normal organ structures. Monoclonal antibodies (MAbs) to liver cell processes are useful in the identification of hepatic carcinomas and normal organ structures. MAb HSA98 binds to human hepatocytes and the majority of human hepatocellular carcinomas (HCC’s). In frozen sections, it stains hepatic cells and may be used as a marker of the liver. Cell preparations of hepatocellular carcinoma biopsies or cell lines are found to bind HSA98 on the cell surface. 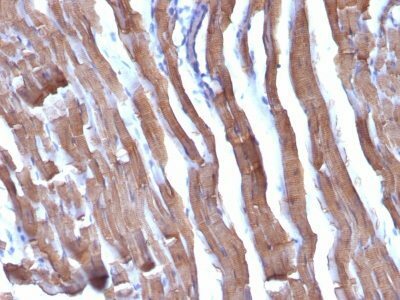 This MAb stains liver hepatocytes in frozen human liver sections and is positive on the cell surface of human liver carcinomas. Catalog number key for antibody number 0098, Anti-Liver Canuliculi (HSA98) The prefix indicates conjugation, followed by the antibody number and size suffix.